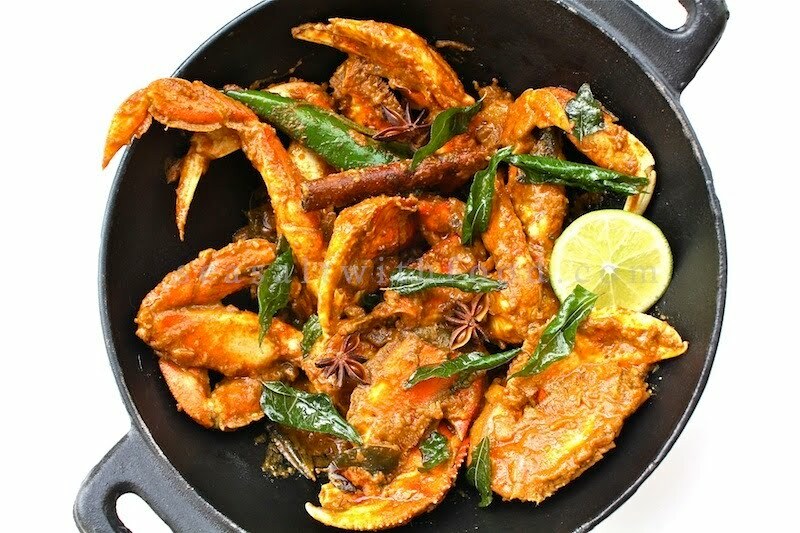 If you love crabs like I do, then you ought to try my favorite Malaysian Dry Curry Crabs recipe. Get your fishmonger to prep the crabs, discard the hard shell and reserve the tomalley. 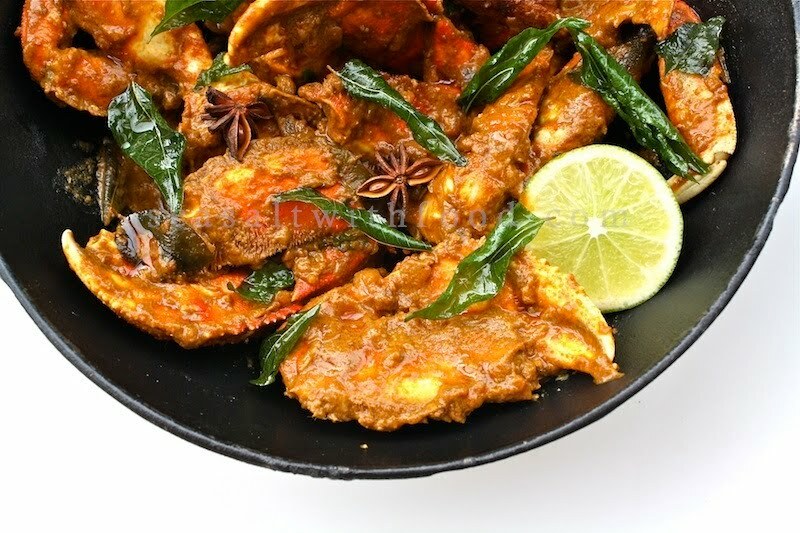 The coconut milk does make this dish a bit rich; but, it blends so well with the crabs and rest of the ingredients like curry leaves, curry powder, garlic, ginger, star anise, cinnamon, green chilies, and chili powder. Wish I can post the delicious smell and flavors of this dish. :-) Yummy! In a large wok, heat the oil on high heat. Fry the (2 sprigs) curry leaves until crispy. Set aside for garnish. Using the same wok over medium to high heat, add the cinnamon stick and star anise. Cook until fragrant and mix in the onion, garlic paste, ginger paste, and the remainder curry leaves. Cook until the onions are soft and light brown in color. Add the curry and chili powder. Cook until they are fragrant for about 2 minutes. Mix in the coconut milk and bring the curry sauce to a boil and add in the crabs and the tomalley. Turn the heat on high and bring the sauce to a boil again. Then lower the heat to medium and continue to fry the crabs for about 10 minutes and toss in the green chilies. Season the crabs with lime juice and sea salt, if necessary. Continue to cook for another 5 minutes or until the sauce has thicken. 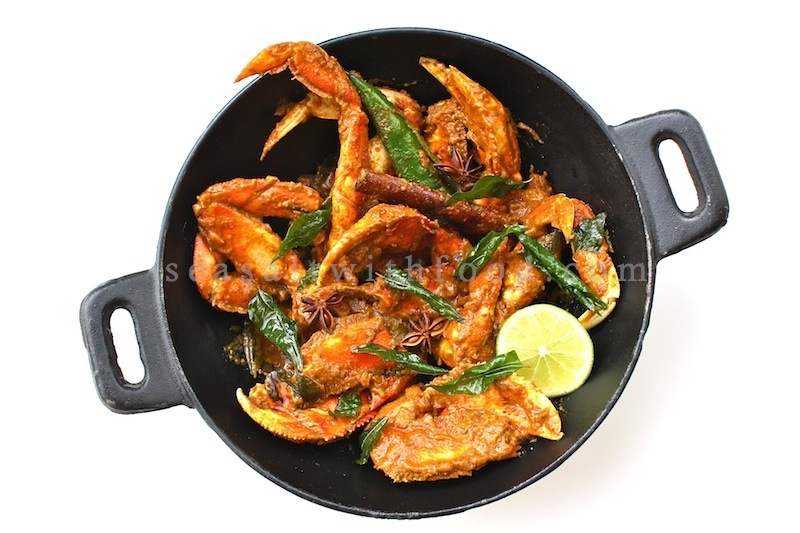 Garnish the crabs with fried curry leaves and serve warm. those crabs look incredible!!! wow, such great flavors....thanks for sharing! This dish is overwhelming in fragrant flavors. I'm sure if I was to make this dish, it would become on of my favorites. Perhaps, I'll pass it along to my father so he can cook it for me the next time I visit home. I made this dish lastnight & it was fantastic ! THANK YOU SO MUCH !